If you look at the two maps below you can see on the earlier version a farm called Liapa or sometimes locally it was referred to as Leeper. You can also see that on the modern version the farm is now called Moor Gate. When and why the name was changed I know not except in the early 1900s it was Liapa and by the 1920s it had changed to Moor Gate. The latter place-name is easy to define as some 500 metres from the farm is an actual moorgate but as far as Liapa/Leeper goes I can find no explanation. Neither could Eric Hemery but he does give us a name of who instigated the change for he comments; “… it seems a pity that Dr. Fraser, who subsequently purchased Liapa Farm as a residence, should have chosen to substitute the name ‘Moor gate‘” p.715. However, it is not the farm we are concerned with here but a small wayside cross that sits on the left-hand side of the lane leading down to Moor Gate. This lane is actually part of the old track-way known as the ‘Mariner’s Way‘ which ran from the ports of Bideford to Dartmouth. Amongst the travellers that used the route were sailors who would be changing ships between the ports, a journey of some 70 odd miles. As far as the Dartmoor section of this ancient track-way goes there is only 1 wayside cross that sits along the route – Liapa Cross. Again why this should be is a mystery but perhaps one explanation would be that the cross signified that shelter could be had at nearby West Combe. It is thought that West Combe lay about halfway between Bideford and Dartmouth and so would be an ideal place to seek shelter for the night before continuing the rest of the journey? As noted above, it is very probable that Liapa Cross originally stood on or near the Mariner’s Way but this was not always the case as we can see. Writing in the early 1900s William Crossing tells us that; “A path leads across two fields to Leeper, a border farm, where the upper portion of a fine cross was recently found. As it had been built into the wall of the garden in such a manner as to expose its face, its existence was, of course, known to the dwellers of the farm, but little or no notice had ever been taken of the stone by them.” p.151. Shortly after Crossing’s comments the Viscount Hambledon had the cross removed and taken to his house at North Bovey. 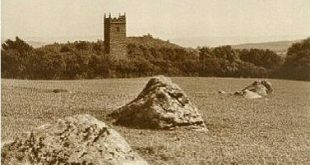 In 1937 the manor and house was sold and Liapa Cross was returned to its present resting place at the instigation of the Dartmoor Preservation Society. Starkey, pp. 62 -63. Although it is impossible to gauge the measurements of the cross today thanks to a shroud of creeping ivy they were when I took them in 1996 the following; height – 1.07 metres, arm span – 59 centimetres and circumference – 1.24 metres. As can be seen below at some point in its career one of the arms had been knocked off and the lower half of the shaft amputated. Liapa Cross first became a Grade II listed building in 1974 and according to Historic England the reason for its designation was: “Over 350 wayside crosses are known nationally, concentrated in south west England throughout Cornwall and on Dartmoor where they form the commonest type of stone cross.” So to me that would make the cross a pretty important monument in light of there being only around 350 such crosses nationwide. Not only that but due to the cross having a raises cross on its both faces makes this a rare feature among the crosses of Dartmoor. If you look at the photographs below they clearly show that from 2013 – 2015 the cross has been left to the encroachments of mosses and ivy and things have not improved as of August 2016. Surely for such an ancient monument somebody should be attending to its upkeep albeit the Dartmoor National Park Authority or even the people that live at Moor Gate. It certainly is not a major operation to clear away the undergrowth and restore some dignity to something that has survived since medieval times? What makes this even worse is the fact that this is not the only ancient wayside cross on Dartmoor that has been left to the encroachment of mosses, ivy and other vegetation. They are an important part of the moor’s heritage and should deserve special attention to keep them in good condition. As you can see from the photographs above, having made a 200+ round trip to take the pictures a sharp knife and some judicial pruning restored the cross to near 1947 condition. If I had a saw I would have removed the sodding great gorse bush which sat stubbornly in front of the cross. Crossing, W. 1987. The Stone Crosses of Dartmoor. Exeter: Devon Books. Hemery, E. 1983. High Dartmoor. London; Robert Hale. Starkey, F. H. 1983. Dartmoor Crosses & Some Ancient Tracks. F. H. Starkey. For some odd reason Hayward gives no mention of the cross on his H15 page, he is more concerned with West Coombe Farm despite the fact he must have walked past the cross on his visit? Previous The Fox’s Prophecy Poem.